The statue was soon liberated but Argentina is unlikely to win an early release from its economic crisis. The policies that ensnared the statue are also partly to blame for the turmoil that drove the peso into a tailspin in January. Shunning market forces, Buenos Aires imposed import controls and attempted to restrict Argentines from swapping their increasingly worthless currency into US dollars, fostering a rampant black market and shattering confidence in the peso. 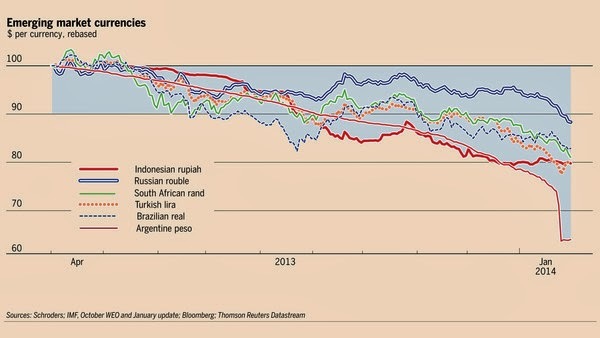 But do Argentina’s woes foreshadow a common destiny for emerging markets? Economists say that although all developing nations are vulnerable to the unwinding of US monetary stimulus, the prospect of slowing Chinese growth and other global influences, the differences between them are at least as important as their collective frailties. The charts and postcards from the six countries profiled on this page illustrate both similar traits and divergent degrees of stress. Neil Shearing, chief emerging markets economist at Capital Economics, sees a new phase in the recent currency turmoil. “The fact that currencies have continued to weaken even in countries that have started to raise interest rates raises the prospect of a new, and potentially more worrying, phase of the recent turmoil in EM financial markets in which beleaguered policy makers find themselves unable to defend their currencies,” he says. Much remains in flux. In several countries, the transmission mechanisms between financial market turmoil and distress in the real economy are grinding into gear. The prospect that these real impacts may themselves form a cycle of contagion among emerging economies is becoming a big concern. In an echo of Argentina, people in several emerging markets are hedging against rising domestic inflation and a depreciating home currency by shifting savings into US dollars. Russia’s leading tabloid, Komsomolskaya Pravda, advised its readers this week to shift 30-40 per cent of their savings into US dollars and euros. A related concern is that the rises in interest rates needed to combat rising inflation and defend currencies could hit indebted corporations, forcing them to scale back investment plans. The demand shock on manufacturers in Argentina, say Tony Volpon and George Lei at Nomura, could affect Brazilian suppliers to those Argentine factories, wiping 0.2 per cent from Brazil’s projected gross domestic product this year. Standing at a branch of Serasa Experian in São Paulo, Daniel Sanchez greeted the news of more Brazilian interest rate rises with weary resignation, writes Joe Leahy. “I was hoping to pay off this debt this year but now with this rise in interest rates only God knows. Each year something new appears,” says Mr Sanchez, a systems consultant, who borrowed R$5,000 three years ago. The country’s rates, already among the world’s highest at 10.5 per cent, are only set to rise again as fears over emerging markets and tighter US monetary policy force central banks in developing countries to defend their currencies. The largest emerging economy after China, Brazil has shaken off its historic financial frailty and stands as one of the stronger of the Brics group of big developing countries, which also include Russia and India. Dependent mostly on internal consumption and with reserves of about $375bn, it has considerable leeway to manage shocks. 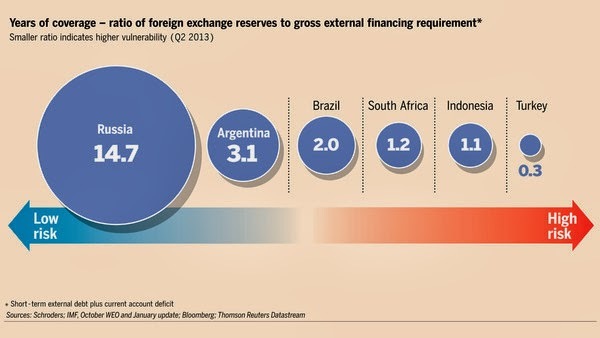 When the real started to depreciate rapidly last year, Brazil responded with a $60bn currency intervention programme. This time the central bank is raising interest rates. Its move in January was its seventh consecutive rise. But for all its strengths, Brazil is fighting persistent inflation that is hovering near the top of the central bank’s target of 4.5 per cent. The government has been nursing the economy for three years through a fiscal stimulus programme originally aimed at curbing the effects of the eurozone crisis. The tax breaks and high levels of state lending involved in the programme, combined with accounting tricks to disguise the true level of the budget deficit, have undermined Brazil’s credibility in the eyes of rating agencies. With the country hosting the soccer World Cup in June and an election due this year, the government will be reluctant to curb spending and risk a recession. But its hopes of quietly muddling through may have been eroded by the crisis in Argentina, Brazil’s largest market for exports of manufactured goods. A big drop in exports could hurt Brazil’s chances of hitting the expected growth rate of 2 per cent – in a country that recently thought it could grow indefinitely at 4 per cent. Of the many scarce commodities on the streets of Buenos Aires these days, none is rarer than faith, writes Jonathan Gilbert. Import controls have played havoc with the retail market but the biggest problem facing Cristina Fernández de Kirchner’s government may be plummeting public confidence. “There’s a strange smell in the air,” says Hugo Niglio, 46, describing how he had no trust in the government’s latest scheme to tame a rampant currency black market by easing capital controls. The issue of public sentiment is crucial to Argentina’s chances of weathering its crisis but indications are not good. Moody’s, the credit rating agency, predicts that the peso will lose another 50 per cent of its value by the end of the year because Buenos Aires lacks a credible plan to deal with inflation and the currency’s slump. The peso’s devaluation has also heightened fears of increased inflation, which was unofficially 28 per cent in 2013. The official rate was 11 per cent but the government will release a new index next month after censure from the International Monetary Fund. “There could be a spiral of devaluation and inflation,” says Gastón Rossi, a former deputy economy minister. The central bank raised interest rates by 6 per cent to about 26 per cent this week in an effort to narrow negative real rates, reduce inflationary pressure and discourage Argentines from taking refuge in the dollar. But rates would have to rise to about 40 per cent to lure investors to the peso, analysts say. He says an import order made before the devaluation had been ditched by the supplier, who said they would now cost 30 per cent more. In the streets of Ankara this week, Turks attributed their country’s economic travails to the same ills that Recep Tayyip Erdogan, the prime minister, regularly attacks – a foreign conspiracy and high interest rates, write Daniel Dombey and Funja Guler. “Foreigners don’t want Muslim countries to develop,” says Sedat, a 53-year-old butcher. Sukran echoes Mr Erdogan’s argument that high interest rates cause inflation rather than the other way around. Mr Erdogan reiterated that view on a flight from Tehran as he made clear his unhappiness at Turkey’s across-the-board interest rate rise, which increased the cost of borrowing by between 2 and 3 percentage points. His comments, and the discourse he has encouraged, underline the challenge for any joint effort between government and the central bank to reduce the country’s financial vulnerability by reducing its chronic current account deficit. Fatih Ozatay at Turkey’s Economic Policy Research Foundation lists the perception that the central bank was under political pressure as one of the causes of the country’s predicament, together with US moves to reduce monetary stimulus and political risk in Turkey. Other economists also note that the state was particularly keen to let the good times roll. Mr Erdogan has a pronounced penchant for big infrastructure projects. Most tax revenues come from indirect taxes and a significant portion from import duties. In other words, the more people spend and the higher the current account deficit goes, the bigger the tax take. Now, however, many economists are calling on the government to retrench. With the current account deficit underwritten by short-term foreign funds that are now in doubt, Turkey’s savings may need to rise. Mr Ozatay and others argue that increased savings would be best produced by a government surplus and that the economy will suffer more if the burden of retrenchment falls exclusively on the private sector. Whether Mr Erdogan, Turkey’s ultimate economic arbiter, is convinced is quite another matter. 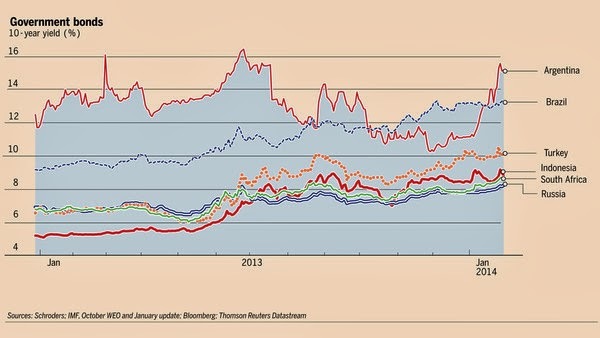 A weakened rouble is a problem Russia’s central bank can live with, writes Courtney Weaver. But the wider economy could suffer significantly as imported inflation surges, consumer spending is hit and people shift their savings from roubles into hard currencies. As the rouble touched new five-year lows against the dollar and the euro this week, Russia’s food, clothing and electronic retailers warned of price rises in double-digit percentages. According to the Russian state statistics service, imported goods account for two-fifths of all Russian retail sales year-round. The proportion is even higher in the winter when most fresh produce must be imported. Russia’s main alcohol lobby predicts the price of imported liquors will become 10 per cent more expensive, while the country’s main textile lobby is warning of a 15 per cent price rise for clothes – 75 per cent of which are imported. While the devaluation is less than ideal for the Russian consumer, who typically relies on imported goods and prefers to go on holiday abroad, it is tolerable for the central bank. In recent years the central bank has adopted a policy of inflation targeting that it is sticking to, for now. The central bank says it is ready to use “unlimited” foreign exchange interventions to keep the rouble from sliding outside the desired trading band. But so far it seems committed to bringing the rouble to a free float by 2015. Traders are wondering whether Russia could “pull a Turkey” by raising rates on February 14, but most economists think it unlikely. Russia is not expected to start running a current account deficit for at least another year, so capital outflows are less of a concern. By choosing not to intervene, Russia’s central bank “is signalling very strongly that it is fully committed to becoming a fully fledged inflation-targeting country by 2015, even in this environment of pressure on the rouble”, says Ivan Tchakarov, Citibank’s chief economist for Russia. This could change, however, if Russia sees a rush on the dollar the way it did in the 1998 and 2008 financial crises. Komsomolskaya Pravda, a tabloid, advised Russians this week that it was best to keep 30-40 per cent of their savings in dollars and euros – “and not at home under your pillow but in the bank”. As global liquidity retreats from emerging markets, a real-life deluge has inundated Jakarta in recent weeks, highlighting Indonesia’s economic vulnerabilities just as currency market bears are on the prowl, writes Ben Bland. Many in Indonesia say Jakarta should have used the past decade of cheap credit and rapid growth to build more infrastructure – including flood defences – that could have raised economic efficiency and eased the congestion that clogs the capital. Hit by a confluence of concerns – including the prospect that dislocations caused by flooding may help drive inflation above the 8.38 per cent seen in December – the rupiah slid by 0.37 per cent against the dollar in Asian trade on Thursday. Since the start of the year, the floods in Jakarta have killed more than 20 people and forced more than 20,000 to flee their homes. Nevertheless, not all is gloomy in southeast Asia’s largest economy. In sharp contrast to Argentina and several other EM economies hit by recent currency contagion, Indonesia managed to shrink its current account deficit in the fourth quarter of last year, largely as a result of central bank policy. The five rate rises totalling 175 basis points since June 2013, along with the slide in the rupiah’s value, have curbed demand for imports. 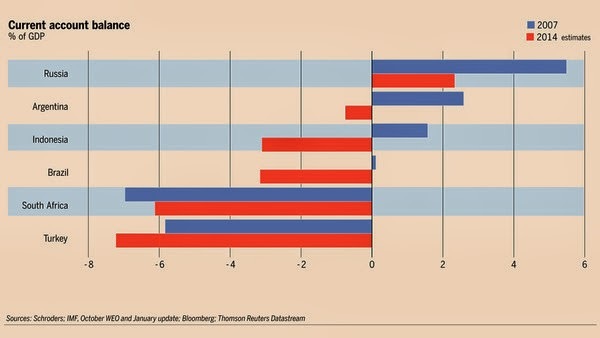 Economists predict that the current account deficit, which hit 3.6 per cent of GDP last year, will contract further in 2014. “Over the next 12 months, we forecast a current account deficit of 3 per cent of GDP,” says Prakriti Sofat, an economist at Barclays in Singapore. In another demonstration of confidence, international investors lent Indonesia $4bn earlier in January – Asia’s biggest dollar bond issue since 1998. In a wine and spirits shop in an affluent neighbourhood in Johannesburg, recently crafted homemade signs on display alongside bottles of Scottish single malts offer a 10 per cent discount on any whiskey selling for more than R500 ($45), writes Andrew England. “I just want to see if we can attract the customer,” says Monty Vallabh, who runs the liquor store. Like other South Africans, Mr Vallabh is feeling the pinch of a lacklustre economy, a sharply depreciating currency, the pressures of inflation and subdued consumer confidence. South Africa, Africa’s largest economy, raised interest rates for the first time in five years this week as it strove to combat rising inflation and defend the rand. The currency has fallen more than 6 per cent this year to five-year lows against the US dollar. Although vulnerable to the unwinding of US monetary stimulus, many of South Africa’s frailties are domestic in nature. Electricity tariffs and wages are rising sharply, hurting manufacturers and miners. Unemployment remains stubbornly high at about 25 per cent and the current account deficit hit 6.8 per cent of gross domestic product in the third quarter of 2013. There are few signs of an improvement on the horizon in any of these important metrics. New strikes are affecting the platinum sector this month and the ruling African National Congress is facing a tough test at polls – expected in April and May – adding to uncertainty. Given this confluence of issues, the last thing that the country needs is a slowdown in consumer spending. But anecdotal evidence suggests just such an easing in momentum. “Guys who used to come and buy a case of beer will now buy a pack of 12 or six. A guy who used to buy a case of wine will now just buy one or two bottles,” Mr Vallabh says.